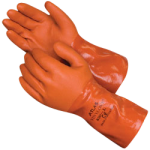 CWC offers Atlas durable heavyweight PVC gloves in double triple and full dipped. Strong yet extremely soft and flexible these gloves feature a soft warm lining. The rough textured coating ensures grip and increases the gloves abrasion resistance and durability. The gloves are also oil resistant and chemical resistant.